Vanuatu is scheduled to graduate from the category of Least Developed Countries (LDCs) on 4 December 2020. It will then be considered a developing country. This is a remarkable achievement for development as only five countries have graduated from this category since 1971. Graduation will bring to the country opportunities and prosperity. It may also pose some challenges. Overcoming these is critical for a smooth transition process and the long-term development prospect of the country. The United Nations has classified 47 countries as “least developed”. Suffering from severe structural impediments to sustainable development, these countries are home to 1 billion people but account for less than 2 per cent of the world’s GDP and about 1 per cent of global trade in goods.They are commonly identified based on the levels of income per capita, human development and economic vulnerability to external shocks. Is Vanuatu an LDC? What does being an LDC mean? Vanuatu and three Pacific peers (Kiribati, Solomon Islands and Tuvalu) are classified as LDCs. Vanuatu has been an LDC since 1985. LDCs are globally recognized as countries that struggle with sustaining human and social development. To foster their development, they receive special attention from the international community. Thus, they are entitled to receive several benefits called the international support measures (ISMs), such as access to development finance, trade and market access, technology transfer, and technical assistance. Can LDCs graduate from the LDC group? Yes. LDCs become eligible for graduation if they meet certain eligibility criteria. The Committee for Development Policy (CDP), a subsidiary body of the United Nations Economic and Social Council, reviews the list of LDCs every three years based on the three eligibility criteria: income per capita, human assets index and economic vulnerability index. Once the country meets these criteria for two consecutive reviews, the CDP recommends the Economic and Social Council to consider its graduation from the category. Vanuatu is already on its way to graduating from the LDC category. It is scheduled to graduate on 4 December 2020. This is a remarkable development achievement. Indeed, only five countries have been able to graduate since the establishment of the LDC category in 1971. Samoa is one and graduated in 2014. Vanuatu will be the sixth country globally to graduate from the LDC group. What are the implications of LDC graduation? Graduation brings to the country several opportunities, prosperity as well as challenges. Once Vanuatu graduates from the LDC category, LDC-specific entitlements or ISMs will be systematically phased out. For example, beef exports to Japan and coconut oil exports to Taiwan Province of China may face higher tariffs if there is no bilateral negotiation. Nevertheless, impact assessments conducted by the CDP, the Government of Vanuatu and UN-ESCAP all concluded that the overall impact of losing access to trade-related ISMs will not be significant in Vanuatu. Vanuatu will also technically lose the LDC-preferential allocation of aid or face potentially higher costs associated with concessional loans. However, being an LDC is only one factor in determining aid allocations. Other factors such as historical and cultural ties, or specific vulnerabilities such as being sea-locked and having a small population, are also relevant. Furthermore, LDC status is not a determinant of South-South cooperation. For instance, concessional loans and aid finance from China are unlikely to be affected by this status change. Indeed, the benefits may be greater. Vanuatu may gain greater flexibility in the terms of aid disbursement, including greater use of general budget support, as well as access to a broader range of commercial and concessional lending packages.This flexibility may be an opportunity for the country to move forward with necessary reform to continually improve fiscal management and provide the policy measures to promote broad-based economic growth. Another channel through which Vanuatu can benefit from LDC graduation is climate finance. 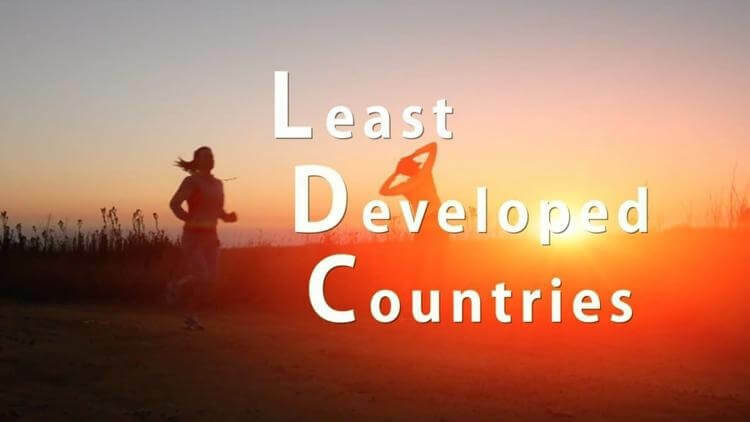 On the one hand, graduated LDCs lose access to LDC-specific funding, particularly to the Least Developed Countries Fund (LDCF), and have to compete against other developing countries despite their limited institutional and human capabilities. The high level of fragmentation prevalent in the field of climate finance exacerbates this process. On the other hand, Vanuatu can access various other climate finance opportunities, which are estimated to be far greater than the total funding capacity of the LDCF. Improved financial management, safeguards against unforeseen environmental impacts and improved quality and efficiency in project delivery, all of which can be achieved in the accomplishment of LDC graduation, will enhance accreditation credentials for directly accessing climate funds. Gaining accreditation, in turn, will demonstrate to Vanuatu’s development partners that its national systems are robust and sound, giving them more confidence in Vanuatu. What are the opportunities for Vanuatu? Vanuatu’s new status as a developing country will send a strong signal to the rest of the world that we are ready for business and that Vanuatu is poised to embark on a new development trajectory. From an investor’s point of view, graduation is indicative of a more investor-friendly climate. It signals that good infrastructure is available. It signals that the political situation is stable and that macroeconomic policy is more predictable. Importantly, it signals the country’s strong commitment to sustainable development. The improved image as a developing country, rather than a least developed country will help strengthen Vanuatu’s creditworthiness and in the eyes of international rating agencies. This will attract larger flows of foreign direct investment (FDI) and create new opportunities for obtaining international commercial loans at more competitive rates. Its new-found status will also help Vanuatu to mobilize resources from global markets through sovereign bonds, while the private sector can also tap capital from global financial markets. What needs to be done to prepare for graduation? Given the potential impact of the withdrawal of LDC-specific entitlements and considering that the benefits depend on how the country grasps opportunities provided by its improved image and flexibility in fiscal management, a careful management of the transition to actual graduation on 4 December 2020 and beyond will be essential. First, the overall productive capability of the economy has to be strengthened. This should be achieved in the process of the generation and strengthening of linkages between existing primary production (i.e., agriculture and fisheries) and more value-added sectors (i.e., manufacturing of export products for quality, niche markets and value-added services, such as tourism). For example, much of Vanuatu’s cocoa is currently exported to the bulk grinding markets in Malaysia, which offers lower prices. With a growing demand for high quality, single origin chocolate, Vanuatu can benefit from improvements to the quality of its cocoa product and developing its fledgling domestic boutique chocolate industry. Such processes would not only increase value addition but also productivity within sectors and shift labour from lower to higher-productivity sectors, thereby creating more, better remunerated, formal and higher-productivity jobs. Second, to prepare for the end of various international support measures, Vanuatu needs more financial resources for its development. Domestic tax reforms and international tax cooperation and transparency will be necessary to ensure long-term fiscal sustainability. More tax revenues will allow expanding public services and increasing the quality of education and training. This is required as more skills are required as the economy develops. A slow transition to a system of income taxation will, therefore, be required. There is also considerable untapped potential to increase financing through public-private partnerships to strengthen infrastructure. At the same time, more resources are needed to foster the development of micro, small and medium-sized enterprises. These enterprises are critical for providing employment across islands and are a critical engine for Vanuatu’s economic growth. What lies ahead? How is the Government preparing for Vanuatu’s smooth transition? The National Coordinating Committee (NCC) has been established by the Council of Ministers (COM) decision to oversee the county’s transition beyond graduation. It will help raise awareness with stakeholders at the provincial consultation, organise inputs across all government agencies, solicit funding and leverage private sector investment. In 2019, the NCC with the assistance of a technical working group will finalise the Smooth Transition Strategy for Vanuatu graduation, in collaboration with the United Nations Economic and Social Commission for Asia and the Pacific (UN-ESCAP). By November 2019 the smooth transition strategy will be presented to the Council of Ministers (COM) for approval and endorsement. The technical working group will be providing regular updates and information on the progress on the development of the smooth transition strategy. A smooth transition will be dependent on improving institutional and productive capacity; providing stimulus for the private sector to flourish; ensuring inclusive and culturally sensitive development; and mitigating deep-rooted vulnerabilities.